A non-profit organization / project in which I have been managing the operations and co-hosting the conferences. WAW China has local conferences that have been hosted in Shanghai, Beijing, Hangzhou & Shenzhen. 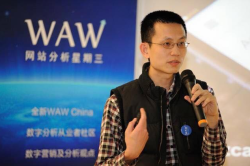 WAW China’s official website, www.chinawaw.org, and official WeChat public account have been sharing Internet Marketing & Web Analytics topics to the local public. Over the years I have worked with several Internet companies in China (Shanghai & Hangzhou) and South Africa (Cape Town & Johannesburg). During my time at these companies, I have headed multiple teams including Internet Marketing, SEO, PPC, Web Analytics, Website Operations, Website Content Management & Translation, Multilingual Website Projects, and more. Oct 2012 – Oct 2013: HRS.cn (Hotel Reservation Services), Germany based hotel booking aggregator. Jun 2009 – Aug 2012: Ctrip.com, a Shanghai based company which is the largest Chinese travel booking website. Sep 2007 – Jun 2009: Alibaba.com, a Hangzhou based company which is the largest B2B website in China. Feb 2006 – Sep 2007 and Nov 2013 – Dec 2015: Clicks2Customers (C2C), a Cape Town based search marketing agency. Feb 2002 – Jan 2006: Slickstreet Marketing, a Johannesburg based company which does Internet marketing, including SEO, PPC, guerilla marketing and more.